It is interesting to notice that how friendship of over sixteen years makes us so comfortable with one another and requires so less explanation. And for such friendships, a trip like this is an opportunity to recollect the best old days and fun filled memories. It all began when Gurudeep suggested we go on a trip to historical places and when we met at Kishan’s house sometime in June we confirmed the plan. Guru, Bharath, Kishan, Vathsala, Shiva, Preethi and me, seven of us left Bangalore at around 4:30 AM and in two cars we drove towards our weekend destination – Sakleshpur. Kishan was insistent on visiting the Rosary church that he had read about in my blog. So at 7:20 AM we made our first stop at Shettihalli and what a surprise it was to see the church all submerged in back waters of Hemavathi dam. A complete different appearance from what it looked like when I visited in March. After a short walk till the bank, we returned and continued with our journey to Sakleshpura. Two kilometers after Sakleshpura town, is a right (Y Sahped deviation) to Mudigere. 14 kilometers after that is Hanbal, where we were supposed to take a right at the circle but instead in a hurry we took right as soon as we saw the “Hanbal” board. After a few kilometers gone we realized our mistake and returned back on track with the help of a kind omni driver. At circle we take right again and half a kilometer gone we see sign boards leading to our homestay – Makki thitta. A bumpy drive of four kilometers, with underside of the chassis hitting the ground a few times and sludge skidding the tires took us to the homestay. Tejpal, a light hearted, jovial and extremely talkative man runs this home stay which underwent a good renovation recently supported by his son who works in Bangalore. With happy greetings he showed us our rooms and invited us to have breakfast. We were offered two rooms and a glass house. The glass house was however the best spot with a panoramic view of paddy fields and hills. For breakfast we had hot but thick neeru dosa (supposed to be very thin), rice bath, thate idli and delicious Badusha sweet. 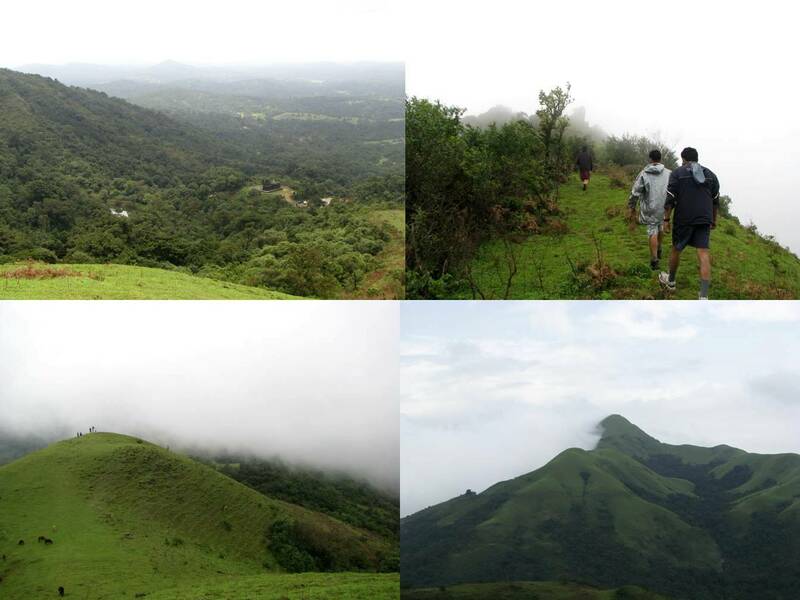 Initially we had planned to trek the Jenkal gudda but Tejpal would not let us do that trek in the rain. He said it would be slippery. But noticing the delay already we decided to hire a jeep and drive to a few attractions around the place which luckily did involve a trek too. The jeep took an even worse road with more sludge. Our first stop was at Bettada Byreshwara temple, a beautiful temple built with stone. We began our trek up the small hill by the temple. We climbed one and then saw the next and then another and another followed by more. It was beautiful; I think we almost climbed 5 small peaks that were connected to one another. With mist masking and clearing the gorgeous view and with our fun filled speech the whole experience was fabulous. Our driver led us to the Magajari falls next which is a great place. 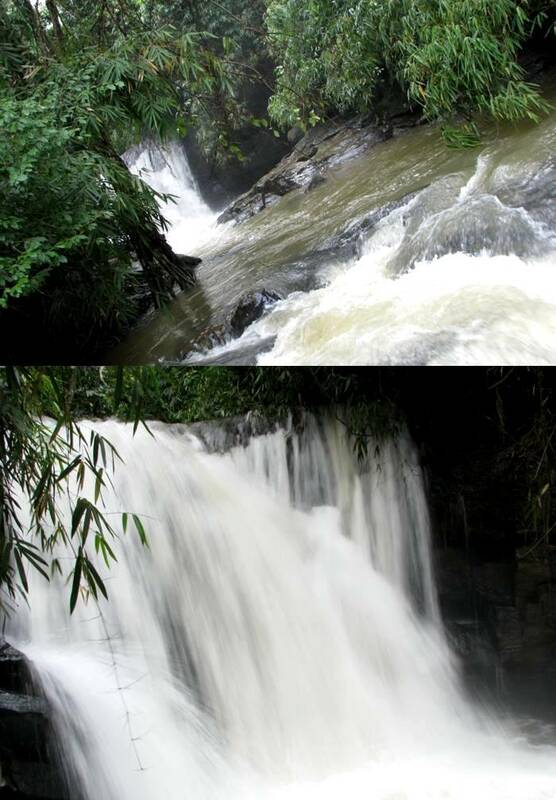 The falls has to be reached by a difficult route, trekking down into a slippery path and you reach a rock right in front of the lush fully falling water. On our way back the jeep got stuck in sludge and we had to push the vehicle. In the process the wet mud splattered over our cloth. Deepu had placed himself at the worst location, behind the back wheels and the mud nicely splattered on him. After that adventure we returned back to home stay, had a shower and quick lunch at around 3:30 PM. After lunch we all gathered at glass house and played cards. It was great fun. Unknowingly time passed so quickly with so much of laughter and fun. Tejpal also arranged a small game in the dining area for all the inmates of the home stay in which Kishan and I won prizes (Some cardamom and black pepper). We took a walk to a stream nearby and chatted for a while in the moonlit night. Shiva showed us a demo on how fishes attracted to the torch light come to surface and are caught by fishermen. For next one hour or so we recollected fun stories from our college days. All those nicknames re-surfaced, all those events of chits and papers re appeared, all those stories of teachers and friends were recollected. In short, those best days of our life was revisited and for a moment it was just us and the memories. Nothing else mattered; no one else seemed to exist. Next day, we were ready by 8:00 AM. After breakfast and thanking Tejpal and his wife for wonderful hosting we left Makkithittu home stay at Donnihali. Our first stop for the day was Angadi. Angadi which means a market place or shop is 18 km south of Mudigere Town. This place has been identified as Sasakapura or Sosevur which was the original home of Hoyasalas who rose to great power in South India. 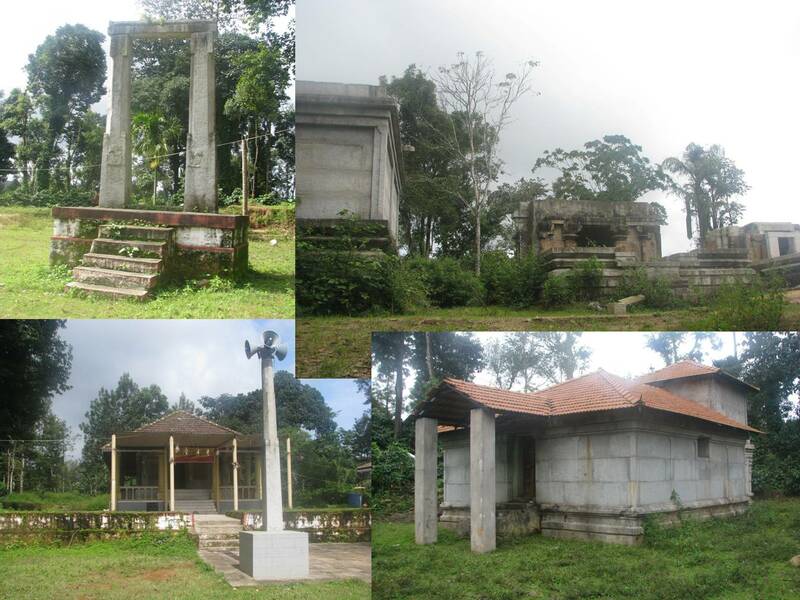 Three ruined temples were dedicated to Keshava, Veerabhadra, and Mallikarjuna. We visited the vasantha parameshwari temple where the priest gave us some background on how the first king of Hoysala rose to power after killing a tiger. 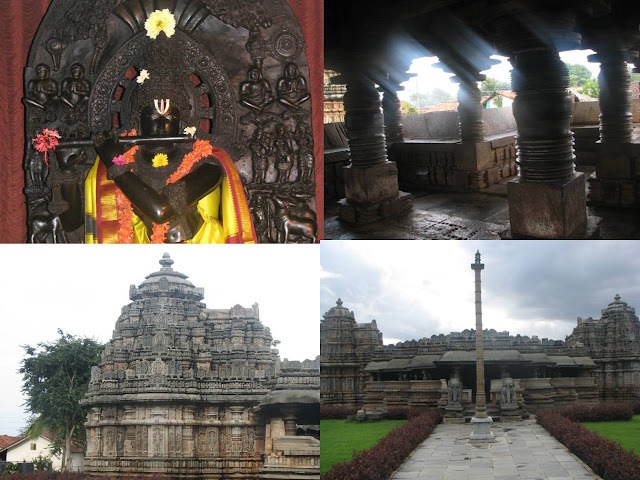 The other three temples are being renovated; however the new additions do not reflect either the charm or the quality involved in Hoysala architecture. The Jain basadi has been renovated. We stopped at an Adi subramanya temple on the way at agrahara, which Tejpal thought we should not miss. Next stop – Chikkamagalur; had some light snacks before we started driving up the Mullayanagiri. The drive was excellent. The sunny Chikkamagalur town disappeared with height and mist at Mullayanagiri. The cliff edge drive is very challenging. 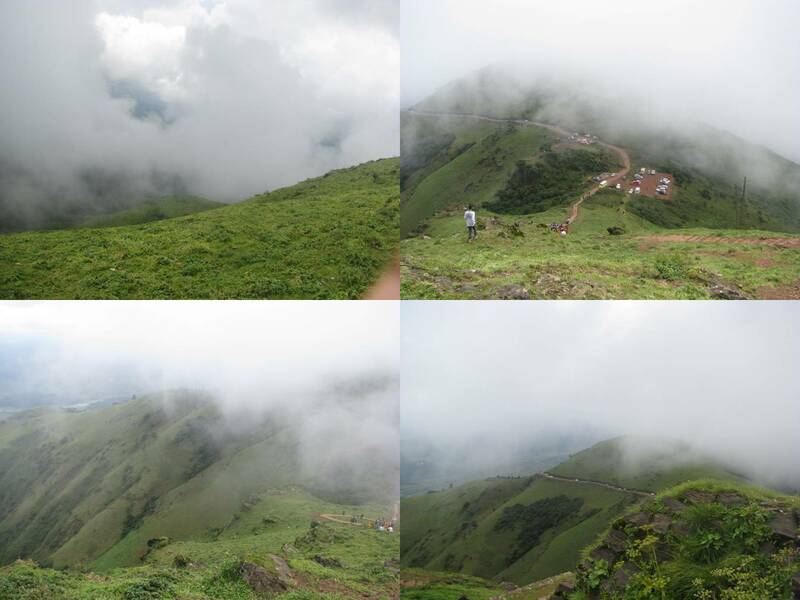 The summit was covered with mist even at 1:00 PM in the afternoon. After a quick lunch we drove to Belavadi, another Hoysala master piece. The Priest here explained the beauty of the idols just like he did the last time I visited. Again a great place to appreciate the ancient south Indian architecture. After Belavadi we drove back to Bangalore via Hassan. The trip was filled with lot of fun and laughter and remembrance of the good old college days that shall recreate and reform itself in such gatherings and so shall the friendship we all share.